Supercharge your pedal board with a single stomp! 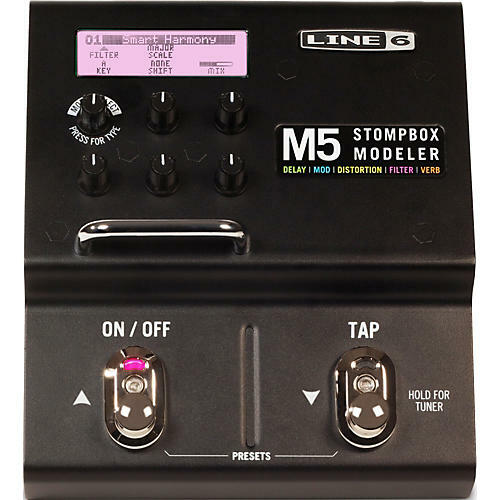 The Line 6 M5 Stompbox Modeler is a "super-stomp" that gives you access to one of over 100 coveted effects at at time with a footprint the size of a standard pedal. But M5 is also different - it's designed like a Swiss army knife to carve out sonic creativity one brilliant effect at a time. Dare to inspire and be inspired with its 100 gain-defying distortions, lush choruses, scintillating reverbs and many other kinds of expressive effects. Why buy another pedal every time you'd like a little extra spice? M5 is your buddy who's got the garage filled with half a century's worth of modern and vintage effects. But this time he'll loan out anything from the collection and never ask for it back. From the classic and timeless to the bold and esoteric, M5 has got you covered. Your instant stockpile is robust, easily switchable and well known - many of the effects are from DL4 Delay Modeler, Verbzilla and other famous Line 6 pedals. M5 costs less than one good single effect pedal, features an easy-to-read screen, and is infinitely customizable. Save the world one effect at a time. Get your M5 now!